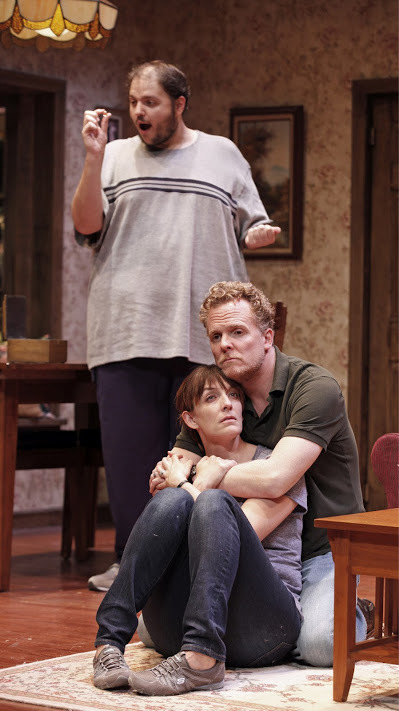 Daniel Pearce, Celia Howard, Daniel Everidge, Jacey Powers & Julia Murney in "Falling". Photo by Carol Rosegg. Mothers often say that they’d give their life for their child–but what happens when the child she loves is truly a danger to her and the rest of the family? Deanna Jent (playwright) on the inspiration for the play: I have an eighteen year old son with autism; Josh is modeled on him. I have older children, twenty-one year old twins. So the world of the play draws on my life experience, although everything in the play has not happened in my house. 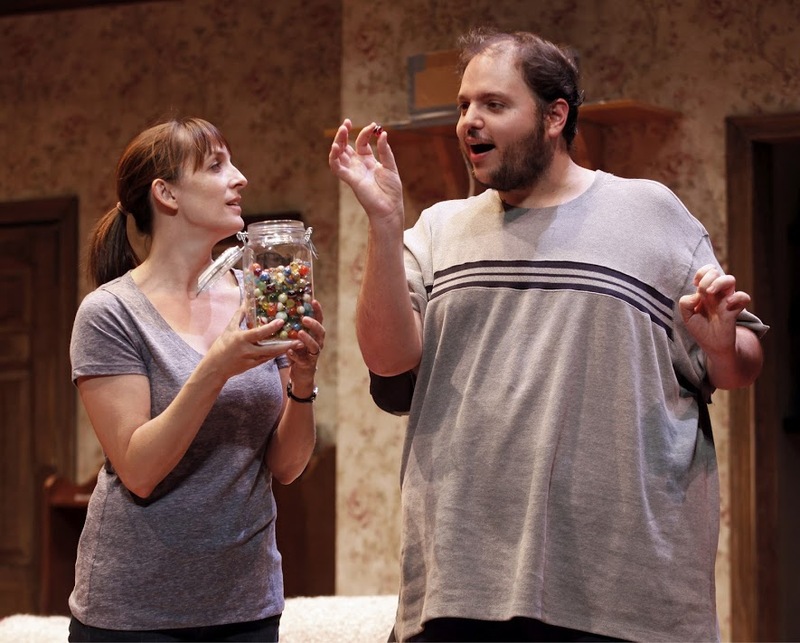 The play also shows one person who has autism. Every individual, like us, is unique and everyone who has autism is unique. Deanna on seeing her life on stage: The first time I walked into rehearsal in St. Louis, the first time after we’d stopped talking about it and the actors were up acting it, I sort of walked into the room — and walked out of the room. I thought, “Woa, that’s my life up there and what will people think.” It was frightening and exhilarating and continues to be so. But what I appreciate is no longer feeling alone. At least all of you know some of my story. Just being able to share that story and have it shared so honestly by these actors and interpreted by this director and these designers is incredible. Daniel Everidge (Josh) on creating his portrayal of a young autistic man: We got to hear a bunch of great stories and see some incredible video of Andy, that Deanna brought in. She was an open book to all of our probing questions. Initially it began as me trying to impersonate her son, I guess you could say… And then I started observing as much as I could — the internet is a wealth of resources — from courageous videos parents have put up of their struggles. I started mimicking traits, picking up different things here and there. But that could only take me so far. I found that I was very trapped in that, just trying to impersonate. And so it wasn’t until recently, when I kind of threw that out … and developed it from myself and let (his world) impact me, what these fascinations meant to me, the frustrations and ultimately the freedom that you get being in this kind of world. That’s when I really connected with the character, when it flowed through me instead of collection of traits or mimicry. Julia on the challenge of living in this emotional world eight times a week: TDF hosted an autism-friendly matinee of The Lion King a few weeks ago and the entire audience was made up of autistic children and their families. And some autistic adults and their families. We were invited to go…so we could watch them all arrive and watch the opening number and “Circle of Life.” It was very profound and one of those things where I thought, “I can’t believe I got lucky enough to be picked.” (This play) is part of the story of those people we watched at The Lion King who all just have to push through and do what they can. I feel very honored to get to try to figure it out eight times a week. Am I tired? Sure. But I get to do this so, “Shut it!” I’m not digging a ditch. It’s been a great ride. Julia Murney & Daniel Everidge in "Falling". Photo by Carol Rosegg. Julia on finding a connection to her character and how the play is universal: Deanna always says this is a play about loving someone who is difficult to love. And although I don’t have an autistic history in my family, that kind of base statement, anyone can relate to. That’s sort of where it went from. Trying to understand the triumphs and tribulations of parenting–and then with an extra layer of “holy cow” on top of it, to say the least, is where I came from. 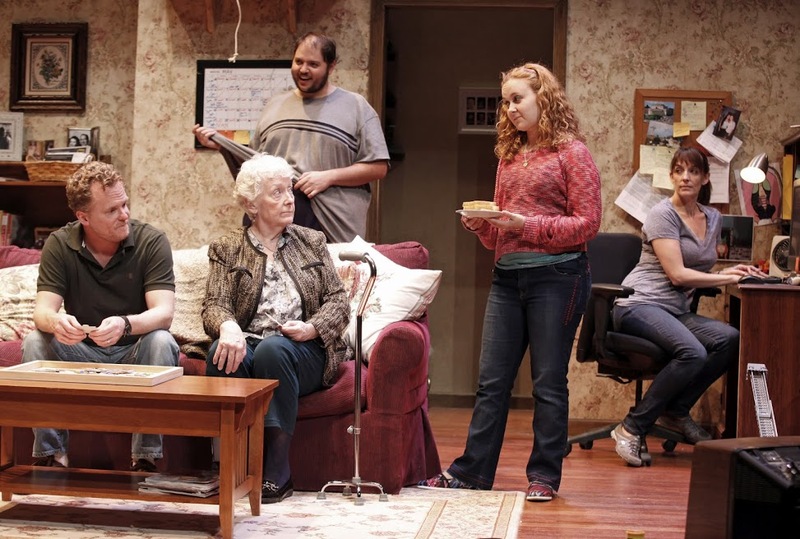 Deanna on the complexity of the situation depicted in the play: Something that was said, I remember, “You know the problem is that everybody is right.” It’s so much easier if somebody is wrong, but they are all right. And that doesn’t fix anything. Deanna on what she feels is needed to help families like hers: The first thing that comes to mind is training and good pay for people…who work with children and families with autism. Like many education positions in our country they tend to be on the lower end of the scale, when I think perhaps they should be making much more. Facilities, not only residential facilities, the money for those, but finding those, managing them, creating communities for our adult population with autism or special needs perhaps that are modeled on retirement communities that we have–where people can live independently or get a little help or get more help than others or get as much help as they need. Those kinds of things I hope will be in our future. Ariana Grande Gives Surprise Performance at Hollywood Concert!